Do you know that Hatsukaichi City is the birthplace of the modern Kendama? There is a monument to commemorate the birthplace of the Kendama near Hatsukaichi City Hall. Kendama was introduced to Japan at the end of the Edo period as a drinking game played at parties. Kendama was re-born as a children’s game after the Ministry of Education introduced it as “Cup and Ball”. 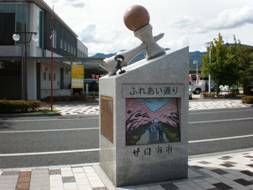 On August, 1918, Hamaji Egusa in Kure City created Kendama in its current form. It was called “Sun and Moon” because of its shape. Hatsukaichi City became the birthplace of the Kendama after it was selected as a Kendama manufacturing area. Players toss the ball upwards and try to catch it on the big cup, center cup, small cup or the tip of the sword. Kendama has enjoyed recent popularity because players can enjoy trying various techniques as well as testing their power of concentration. Hatsukaichi City regularly holds Kendama classes and competitions for all generations. Kendama has become an important symbol linking Hatsukaichi City with its residents. The Japan Kendama Association holds Kendama competitions and provides certificate tests from Level 1 to Level 10. It also holds lasting “Moshikame” competitions, where players catch the ball in the big and small cups alternately, as in the illustration to the left. As of September 27, 2010, the maximum time for competition had been set at eight hours. In all, four people have received records for lasting the full eight hours.